This article is about the U.S. senator from Missouri. For the cricketer, see Stuart Symington (cricketer). For the Scottish engineer and inventor, see William Symington. For the diplomat, see W. Stuart Symington (diplomat). William Stuart Symington, Jr. (/ˈsaɪmɪŋtən/; June 26, 1901 – December 14, 1988) was an American businessman and politician from Missouri. He served as the first Secretary of the Air Force from 1947 to 1950 and was a Democratic United States Senator from Missouri from 1953 to 1976. Born in Amherst, Massachusetts, Symington worked as an executive in his uncle's iron products company and for other companies before becoming president of Emerson Electric. He resigned from Emerson in 1945 to take various positions in the administration of President Harry S. Truman, becoming the first Secretary of the Air Force in 1947. He was elected to the Senate in 1952, defeating incumbent Republican Senator James P. Kem. He joined the Senate Armed Services Committee and the Senate Foreign Relations Committee, and emerged as a prominent critic of McCarthyism. Symington sought the Democratic nomination in the 1960 presidential election with the backing of former President Truman, but the nomination went to John F. Kennedy. After the Kansas City Athletics moved to Oakland, Symington threatened to revoke Major League Baseball's anti-trust exemption, which in turn encouraged the formation of the Kansas City Royals. Symington declined to seek re-election in 1976 and was succeeded by John Danforth. Symington was born in Amherst, Massachusetts, the son of Emily Haxall (née Harrison) and William Stuart Symington, Sr. His father, who received a Ph.D in French literature, was a romance languages professor at Stanford and Amherst College before pursuing a law career and becoming a federal judge in Baltimore, Maryland. His mother, a direct descendant of the influential colonist and presidential ancestor Benjamin Harrison, came from a wealthy family in Virginia. Symington grew up in Baltimore, and was the oldest of his five brothers and sisters. Symington attended Roland Park Public School and the Gilman School, a private all-male preparatory school in Baltimore's Roland Park neighborhood. He graduated from Baltimore City College in 1918, and at the age of 17, Symington enlisted in the United States Army as a private first class during World War I.
Stationed in an Officer Training Program at Camp Zachary Taylor in Louisville, Kentucky, Symington was never deployed to fight in World War I, with the war ending before he could seek deployment. Symington was commissioned as a second lieutenant, becoming one of the youngest members of the Army to achieve that rank; being discharged as a second lieutenant in January 1919. He graduated from Yale University in 1923. At Yale he was a member of Delta Kappa Epsilon fraternity (Phi chapter), the Elihu senior society, and served on the board of the Yale Daily News. In 1924, he married the former Evelyn Wadsworth in a lavish ceremony attended by President Coolidge and other prominent politicians. By all accounts, the two had a very happy marriage and were known for their devotions and faithfulness to each other, both of which were not always present among the social elite. When Evelyn died in 1972, Symington was devastated, telling his biographer that "he never knew this much loneliness could be around." In 1923, Symington went to work for an uncle in the shops of the Symington Company of Rochester, New York, manufacturers of malleable iron products. Two years later he formed Eastern Clay Products but in 1927 returned to the Symington Company as executive assistant to the President. Symington resigned in 1930 to become President of the Colonial Radio Corporation. In January 1935, he accepted the presidency of Rustless Iron and Steel Corporation (manufacturers of stainless steel) but remained a director of Colonial Radio Corporation. When Rustless Iron and Steel Corporation was sold to the American Rolling Mill Company in 1937, Symington resigned and in 1938 accepted the presidency of Emerson Electric Company in St. Louis, Missouri. During World War II he transformed the company into the world's largest builder of airplane gun turrets. He resigned from Emerson in 1945 to join the administration of fellow Missourian Harry S. Truman. His first positions were chairman of the Surplus Property Board (1945), administrator of the Property Administration (1945–1946) and Assistant Secretary of War for Air (1946–1947). On September 18, 1947, the Office of the Secretary of the Air Force was created and Symington became the first Secretary. Symington had a stormy term as he worked to win respect for the United States Air Force, which previously had been part of the Army. He had numerous public battles with Secretary of Defense James Forrestal. During his tenure, there was a major debate and investigation into production of the Convair B-36 Bomber, which was the last piston-powered bomber at the beginning of the Jet Age. He was featured on the cover of Time magazine's January 19, 1948 issue. Major accomplishments during Symington's term as Secretary included the Berlin Airlift and championing the United States Air Force Academy. 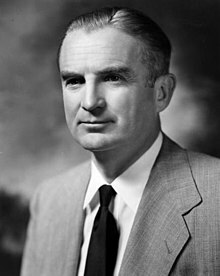 Symington resigned in 1950 to protest lack of funding for the Air Force after the USSR detonated it first nuclear weapon. He remained in the administration as the Chairman of the National Security Resources Board (1950–1951) and the Chairman of the Reconstruction Finance Corporation Administrator (1951–1952). Symington while in the Senate. At the urging of his father-in-law James Wolcott Wadsworth Jr., a former Republican Speaker of the New York State Assembly and U.S. Senator from New York, Symington decided to run for the U.S. Senate. In 1952, he was elected Senator from Missouri, taking the seat previously held by Truman and scoring a win for the Democrats in a year otherwise favorable to the Republicans. He was re-elected in 1958, 1964, and 1970. As a member of the Senate Armed Services and Foreign Relations committees, Symington specialized in military affairs and became known as an advocate for a strong national defense. He was also a strong supporter of the Air Force Academy. In 1954, he charged that the Department of Defense had wasted millions of dollars on outdated weapons. He became a leading critic of U.S. involvement in the Vietnam War (1957–1975). During 1966, he was thoroughly briefed on the Central Intelligence Agency-run covert operations of the Laotian Civil War. At one point, he was a guest of CIA Chief of Station Ted Shackley while touring the Kingdom of Laos. In the early 1970s, when his committee held hearings on the subject, Symington professed shocked outrage at the CIA's audacity. Symington was an especially vocal opponent of Senator Joseph McCarthy, to the vexation of the latter, who nicknamed him "Sanctimonious Stu". He involved himself in the case of Annie Lee Moss, who had been brought before McCarthy's committee under the accusation that she was a Communist spy. Evidence supporting this claim was given by an undercover FBI agent who could not be cross-examined by Mrs. Moss or her counsel. As it appeared that Moss had been mistakenly identified, Symington proclaimed before the packed audience that he believed she was not a Communist and had never been, receiving thunderous applause from those present. 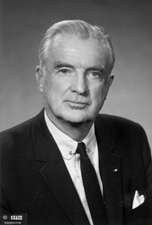 Later that year, Symington took a lead role in censuring McCarthy during the Army–McCarthy hearings, capitalizing upon his prominence and expertise as a former Secretary of the Air Force. In 1959, Symington, then Chairman of the National Security Resources Board in Washington, D.C., was preparing to run in the 1960 presidential election and won the backing of former President and fellow Missourian Harry Truman, but eventually lost the nomination to Senator John F. Kennedy. On July 2, 1960, Truman announced that he would not be attending the Democratic National Convention in Los Angeles. Truman was miffed that the convention was being controlled by the "overzealous" supporters of Kennedy. Announcing his decision, Truman restated his support for the candidacy of Symington and added, "I have no second choice". Symington, unlike Kennedy or Lyndon B. Johnson, refused to speak to segregated audiences in the southern United States and this hurt his chances. Additionally, having concluded that the nomination would be determined by party bosses at the convention, Symington declined to enter any of the Democratic primaries, clearing the way for Kennedy to win enough primaries to be the frontrunner and probable nominee as the convention opened. He was Kennedy's first choice for Vice President, but was dropped in favor of Texas Senator Lyndon B. Johnson. He advised President Kennedy as a member of EXCOMM during the October 1962 Cuban Missile Crisis. Symington was also committed to constituent services, answering letters from Missouri citizens both important, trivial, and sometimes even zany. As an example, Symington once formally requested a report from military sources regarding the possible existence of subterranean superhumans, which one of his constituents had become concerned about after reading a fiction book and mistaking it for non-fiction. In 2002, this and Symington's other senatorial correspondence and papers were donated to the Western Historical Manuscripts Collection of the University of Missouri and are now available to the general public. In 1967 when Major League Baseball owners approved the move of the Kansas City Athletics to Oakland, California, he threatened legislation to revoke the league's antitrust exemption and vowed to support lawsuits challenging the legality of the reserve clause. Kansas City was awarded an expansion team, the Kansas City Royals, which was scheduled to begin play in 1971. Symington, saying Kansas City should not wait, continued to threaten the league, and the team began play in 1969. In 1976, Symington did not seek a fifth term and resigned on December 27, a week before the end of his final term, so that his Republican successor, John Danforth, would gain a seniority advantage in the Senate. In 1962, in recognition of his career, Princeton University's American Whig-Cliosophic Society awarded Symington the James Madison Award for Distinguished Public Service. His son, James W. Symington, served in the United States House of Representatives from Missouri's Second Congressional District from 1969 to 1977. His cousin, Fife Symington III, was Governor of Arizona from 1991 to 1997. His grandson, also named W. Stuart Symington, is employed by the U.S. State Department, serving as U.S. ambassador to Nigeria since 2016; he previously served as the U.S. ambassador to Djibouti (2006–2008) and Rwanda (2008–2011). He is a distant relative of UK-based travel writer Martin Symington. Symington was an active member of the Grand Lodge of Missouri Ancient Free and Accepted Masons. Symington retired in 1978 to his home in New Canaan, Connecticut, where he died on December 14, 1988. He is buried in a crypt in Washington National Cathedral. In Jeff Greenfield's alternate history book If Kennedy Lived, Symington is featured as surviving-President John F. Kennedy's running mate in the 1964 presidential election, after Vice President Lyndon Johnson was forced to leave due to financial scandals. ^ University of Missouri (May 25, 1973). "Symington, Stuart (1901-1988), Scrapbooks, 1945-1976 3637 1 folder, 37 volumes on 6 rolls of microfilm" (PDF). shs.umsystem.edu. ^ a b c d James C. Olson; University of Missouri Press (2003). Stuart Symington: A Life. books.google.com. p. 4. ISBN 978-0826215031. ^ Eric Pace (December 18, 1988). "Stuart Symington, 4-Term Senator Who Ran for President, Dies at 87". nytimes.com. ^ a b United States Air Force (May 20, 2013). "W. STUART SYMINGTON Served as secretary of the Air Force from Sept. 18, 1947 to April 24, 1950". af.mil. Archived from the original on June 26, 2013. ^ James C. Olson; University of Missouri Press (2003). Stuart Symington: A Life. books.google.com. p. 9. ISBN 978-0826215031. ^ "W. STUART SYMINGTON, FORMER SENATOR, AIR FORCE SECRETARY, DIES AT AGE 87". Washington Post. December 15, 1988. ISSN 0190-8286. Retrieved October 5, 2018. ^ Olson, James C. (2003). Stuart Symington: A Life. University of Missouri Press. ISBN 9780826264596. ^ "W. Stuart Symington – Jan. 19, 1948". Time magazine. Retrieved January 6, 2014. ^ Kenneth Conboy; Paladin Press (1995). Shadow War: The CIA's Secret War in Laos. books.amazon.com. p. 375. ISBN 978-1-58160-535-8. ^ Pace, Eric (December 15, 1988). "Stuart Symington, 4-Term Senator Who Ran for President, Dies at 87". The New York Times. Retrieved November 8, 2010. United States Congress. "Stuart Symington (id: S001136)". Biographical Directory of the United States Congress. This page was last edited on 12 February 2019, at 00:33 (UTC).